July Garden Tips | Faddegon's Nursery, Inc. The focus now is on maintaining the beauty you created this spring. Paying attention to watering and checking your plants for insects and disease should be on your to-do list. And then maybe some lounging is in order! Veggies, fruits & berries. Click here for Tips on Edibles in July. Watering. Continue to monitor watering daily. New plants rely on deep watering so their roots can grow downward into the soil, where they will be more likely to find water on their own. Lawns should get 1-1.5 inches of water a week, whether it’s from rain or sprinkler watering. Newly planted trees and shrubs need one to two thorough soakings per week. A day of rain substitutes for a soaking while a quick downpour does not. Lots of rain this year so new trees and shrubs should be doing well! Soaker hoses save you money on water and save plants from threat of disease. Water soaking directly into the ground to the roots of plants keeps water off areas that don’t need it. Check containers often! Some baskets and containers will need to be watered twice a day in the very hot days of mid-summer. Roses are heavy feeders and they need to be to bloom as heavily as they do. Feed with Rose-Tone in the middle of this month. Remove suckers from grafted roses. These are the fast growing shoots from the base of the rose bush. Hanging baskets can sometimes slow down their flower production in mid-summer, don't be afraid to cut the plant back by half and use a liquid feed to reinvigorate it. This will encourage new blooms. Divide. Dig and lift bearded iris rhizomes. This is a good time to divide them. Replanted now, they'll have plenty of time to establish strong roots before the fall. Pruning. Wisteria can be pruned now. Side shoots should be shortened to 6 inches. All pruning of spring flowering shrubs should be finished before mid-month. Pruning after that can remove buds which are setting for next year. Water sprouts that grow straight up from the branches of fruit trees and ornamental trees, should be pruned out. They are fast-growing and weak, but sap energy from the main branches. 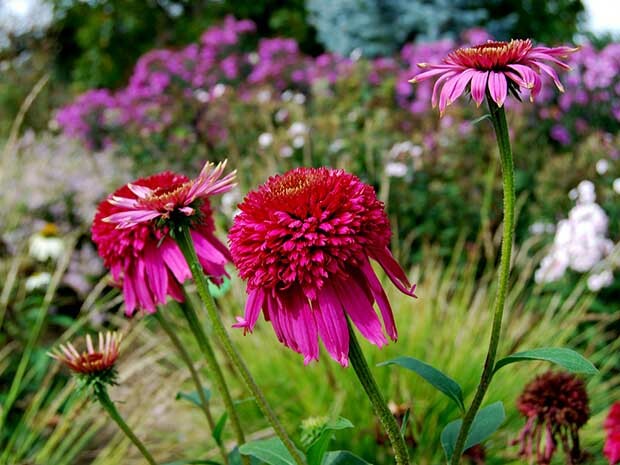 Cut back by half some perennials after the first flush of flowers has faded to encourage new blooms. This includes geraniums, penstemon, delphiniums, lupins, salvia, and catmint. Stop pinching back mums now. This is when they’ll begin to set their flower buds. Lawns. As the weather gets warmer, keep lawns mowed at 2.5-3 inches to defend from weeds and diseases. Longer blades of grass also mean deeper roots! Hot and dry weather stresses the grass and you’ll stress it further by cutting it at too low a setting. You can still overseed or reseed bare or thin parts of your lawn, but keep the spots well watered. If your lawn is developing yellowing and bare spots, read up on chinch bugs. Weeds will still be appearing in your landscape. Read up on weeding solutions. Mulch Mulching helps to conserve moisture and cause plants less stress when summer heats up. When mulching around new trees and shrubs make sure the mulch is a few inches away from the trunk. Not sure how much mulch to get? Use our handy mulch calculator. Think about Pollinators. It benefits all of us to take care to protect pollinators. Pollination is key to plant life and crops, so use organic solutions for disease and insect problems in the garden. Deadhead flowers that appear to need it. Many new varieties of annuals don't need to be deadheaded, but it's a good idea to tour your garden once a week to take care of faded blooms. Rotting blooms not only cause the plant to produce fewer flowers but can also bring on diseases. Slugs are particularly fond of hosta but will make a meal of other plants too. Never seen during the day, the damage they do during the night is evident. Slug Magic is a great product that really does work and is very easy to use and can be used around pets and wildlife. Turn compost over this month. Continue to watch for lacebugs that can be on azaleas and rhododendrons. This is easy to treat and it’s worth saving the appearance of your ornamental shrubs. Find out about Lacebugs. Watch for Lily Leaf Beetles on true lilies (Lilium), Oriental and Asiatic lilies among them. Find out about Lily Leaf Beetles. You won't have to worry about daylilies as they are actually in the genus Hemerocallis. Watch for Clematis Wilt. Does your clematis look like it's dying? Find out about Wilt. Continue to check roses. Soaker hoses are excellent for watering roses. Keeping water off the leaves reduces the occurrence of diseases like black spot. Find out about preventing Black Spot. This is much less of a concern with Knockout roses. Always watch for fungal diseases. If we have cool, moist weather some plants will develop powdery mildew. Plants such as roses, monarda, crabapples, lilacs, and phlox are generally prone. Find out how to identify powdery mildew and how to treat it.